Trek through coastal Florida Singletrack. Traverse shell lined beach trails. Northwest Florida is blessed with sugar white sand and plenty of water, making it perfect for watersports but the great mountain biking opportunities are often overlooked. Mostly because we have no mountains and the trails are often sandy. 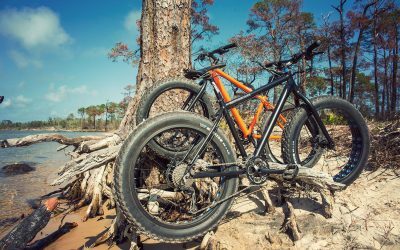 Pensacola Mountain Bike Tours utilizes Fatbikes, mountain bikes equipped with 4 inch tires, enabling you to float over the soft sand. While there is very little in the way of hills, you will get a workout due to the sand and the heat. In the warmer months the guided tours are only conducted in the morning hours, and the earlier the better to avoid the midday sun. The tours are private for up to 3 adults, so it is all about your group and how you want you adventure to unfold. Pensacola Mountain Bike Tours adds beginner DIY beach trail tour!